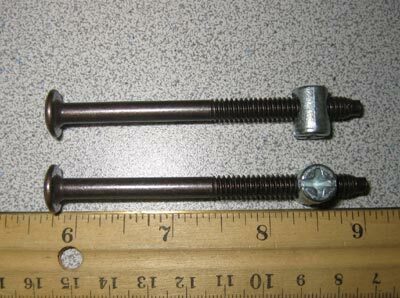 1 Futon Bolt with Barrel Nut - These Bolts are Priced Each, and include 1 Barrel Nut or Cross Dowel with each Bolt. They are used for connecting the arms of the futon to the long support, or stretcher boards. There are several different types of threads, so we sell them as a complete set. There are discounts for buying quantities.